This Jamaican Rum Cake recipe has been in my family for years. In Jamaica we simply call it fruit cake, or Christmas cake. Christmas is incomplete without it, and fruit cake is also a staple at Jamaican weddings. This particular recipe will make you at least 3 cakes in 9 inch tins, but it's up to you to decide if you want to make a larger number of smaller cakes. A single fruit cake is hardly ever made in Jamaica (unless it's a really large one), as every visitor to someone's home at Christmas time expects to be offered cake! Friends come to my house and ask pointedly "You bake yet?" The longer you soak the fruits in this Jamaican rum cake recipe, the better the outcome. Some people soak their fruit for months, but a few hours will still give a tasty result. Here's my Grandma's, and now my mother's Jamaican Fruit Cake. At least a day (longer if possible) in advance, place fruit in a large jar. Pour wine and rum over fruit, so that it is completely covered. Cover jar and leave fruit to soak. Sift together the first five dry ingredients. Add breadcrumbs and lime rind, and mix in well. Cream butter and sugar in a very large mixing bowl. Add browning. Add 4 cups of soaked fruit, stirring in with a large wooden spoon. Beat eggs until light and frothy (10 to 15 minutes). Add rose water, sherry and vanilla. Gradually fold in flour mixture. Test to see if the wooden spoon can stand upright in middle of the mixture. If not, add some more flour until the mixture can support the spoon. Grease baking pans and line with grease paper. Grease and flour lined pans. Pour mixture into tins and bake for 2 hours in a slow oven, 300F. Place a pan of water in the bottom of the oven to ensure cakes do not dry out. Check cakes from time to time, as baking times may vary. Cakes are ready when a toothpick or skewer inserted in centre comes out clean, or almost clean. 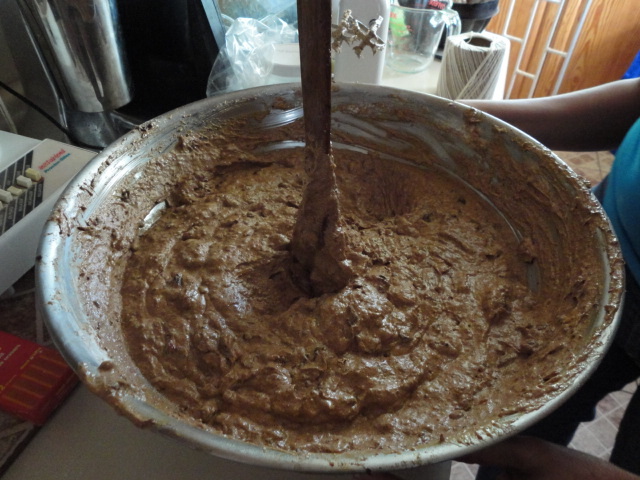 This is a traditional Jamaican Rum Cake Recipe. It takes a little effort, but the outcome is absolutely delicious. To store the cake for a few weeks, keep moist by pouring Red Label wine on the top, and wrapping tightly in aluminium foil. You can experiment with the flavours and spices used, as well as cut down the quantities if you need less cakes. I believe you'll need more cakes, not less!